Tonight’s Cultural Appreciation of Wine class is for people with class and taste. You know….people with a taste and the budget for the finer things in life. The snooty, snobby crowd. I obviously thought I would be out of my element. Art? You mean looking at pictures that people painted? How was I going to stay awake long enough to avoid being embarrassed by snoring and leaving a puddle of drool on my desk? Paul Wagner, my instructor for this Tuesday night, Napa Valley College class, started his weekly sermon on wine and culture by discussing where wine is found in art. The class wound it’s way, with Paul’s direction, into a spirited discussion of wine as a component and subject of art. Now remember that art is a documentation of history. Art changes with culture and reflects that culture. 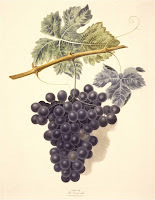 Wine has also changed over the centuries and we can see this in art. We can see how wine was made, consumed, revered and observed in art over the centuries. Art gives us a glimpse into the past and into the cultural psyche of man and how he interacted with wine. OK, and women too. Art can even be expressed by the winemaker and his wine. Consider all the aspects that a winemaker can manipulate in the making of wine to express an artistic impulse. Labels, capsules, bottles shape, bottle color, label text, colors…and all of that is before we even talk about the wine itself as art. Paul had a great line. “Wine can be symphonic or a soloist.” And one could argue, everything in between. A student came back with a quote of their own. 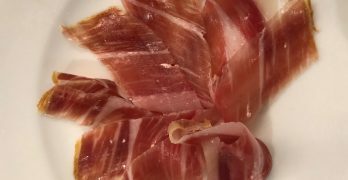 “Trying to describe art is like trying to describe a kiss over the phone.” Just try and describe, how a perfect pairing of wine and food made you feel, over the phone. Will your point truly get across? Does that make wine qualify as art? Just think of how wine can arouse emotion. Doesn’t art do the same? I would argue that wine has components that when combined in the proper fashion, definitely bring the same emotions that a classical song, movie or piece of visual art can bring. Wine is also to the subject of art. Paul treated the class to some of his favorite selections of classical art for discussion. You are such a lucky reader. You get some too. 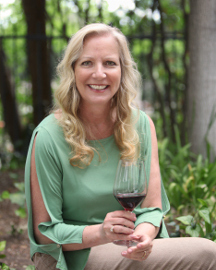 Because this class was focused on visual art, I have included some excellent examples of wine in art in this here blog. This is a very famous example of early art and wine. 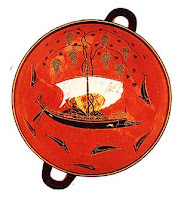 This is a kylix, which is an ancient vessel used to drink wine. 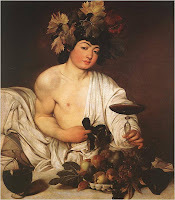 It painted with a story of Dionysus, the Greek god of wine. While disguised as a mortal sitting beside the seashore, a few sailors spotted him, believing he was a prince. They attempted to kidnap him and sail him far away to sell for ransom or into slavery. They tried to bind him with ropes, but no type of rope could hold him. Dionysus turned into a fierce lion and unleashed a bear onboard, killing those he came into contact with. Those who jumped off the ship were mercifully turned into dolphins. Dionysus is represented by the figure sitting on the ship and the mast of the ship, which has turned into a grape vine, bearing fruit. Here we see Dionysus portrayed with the literal body of a god. Doesn’t he seem to be holding a kylix high above you, almost teasing you? Or maybe he is holding it away so you don’t have too much? The expression on his face can be described many ways. Mischievousness. Disdain. Anger. Power. The child he is holding seems to me to be reminiscent of a pig. Does he seem to be gluttonous? Gobbling up grapes that represent wine? This picture shows slovenly characters and Dionysus. And you see a demon behind the God of wine. The man in the forefront is shoeless and has a desperate look. Perhaps begging for what Dionysus has? This portrait of Dionysus, by Carrevagio, is stunning. The colors are vibrant, but at the same time, dark. Dionysus is portrayed as very androgynous. Perhaps symbolizing that wine has the same impact on women as it does on men? In 1629, Diego Rodrigues De Silva y Velasquez painted “The Triumph of Bacchus”. Note the figure in the center of the painting. He appears as real as if he were standing next to you. How does a painter in 1629 capture such realism? Also note Bacchus, as Dionysus was known to the Romans as, to the left. He seems to be just overseeing the revelry of the men. 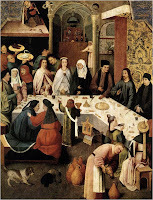 “The Wedding at Canna”, by Bosch, shows the importance of wine. Look where wine is seen. In urns waiting to be poured, being consumed by guests. The chalice, held by the child standing next to the table must be filled with wine. Wine and grapes are also a metaphor for rebirth, as shown on this tombstone. Grape vines “Die” (go dormant) every winter and are born anew each spring. By Currier and Ives, this is called “The Glories of Nature.” this beautiful woman certainly has her arms full of the bounty of harvest, including grapes. By Boilly, this has some of the most interesting faces I have seen in art. Despair? Feeding her child grapes. Her husband only concerned with getting his fill of wine. The class joked that this portrait depicts what the rest of the world thinks the Napa Valley is like during harvest. Beautiful women and rich, handsome men enjoying their harvest. But look behind them. Common laborers. Are the laborers happy as the other people are? Not likely. Ampelography is the depiction of grapevines for scientific purposes. We couldn’t always take photos of things. Talented artists would make highly detailed renderings of objects for historic or scientific recording. This observation of wine and art only barely scratches the surface of the depth of wine’s depiction in art. I couldn’t leave you, Dear reader, without throwing this in. 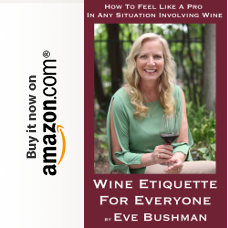 This is publicity piece by a well known Napa Valley Wine Sales Consultation company that shall remain nameless. I have to admit that monster sized bugs are more my speed, but I do hope that your eyes are opened to wine in art, just as mine were, in my Cultural Appreciation of Wine class. Even if there are no centerfolds.